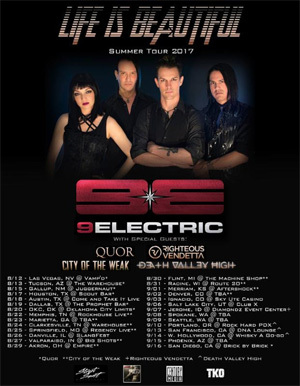 Electronic alt-rockers and champs of the Sunset Strip, 9ELECTRIC, will kick off their North American "Life is Beautiful" headline tour next month - coinciding with the release of their brand new single, "Beautiful", to radio! The tour will begin in Las Vegas on August 12 and is confirmed to visit 25 cities, with more being added soon. The dates will feature rotating support from QUOR, CITY OF THE WEAK, RIGHTEOUS VENDETTA and DEATH VALLEY HIGH. Ron "Thunderwood" Underwood states: "9ELECTRIC is beyond excited for our first headlining tour - just in time for the release of our first single to radio, "Beautiful"! We're gonna be tearing the roof off so many cool spots with our new lineup. Fans have been asking for a longer set every tour and now as headliner we can give them what they want, and add a few surprises to our show. We seriously can't wait for this tour!" Guitarist Mikey Lopez adds: "We're excited to have four different opening acts out with us on our 'Life Is Beautiful' summer tour. We thought about what GUNS N ROSES and a number of other legendary bands have done with their tours by having different bands in different cities, and we thought it adds an extra level of excitement to the lineups. We're very happy to have QUOR, CITY OF THE WEAK, DEATH VALLEY HIGH and our friends in RIGHTEOUS VENDETTA joining us in different regions. It's definitely going to be fun and promises to keep everyone, including us, on their toes!" Get your tickets and check back for updates via the band's Bands In Town page. See below for all currently confirmed dates. 9ELECTRIC released their latest album, The Damaged Ones (Century Media), last year. The Damaged Ones was co-produced by Micah Electric and Kane Churko (OZZY OSBOURNE, PAPA ROACH, FIVE FINGER DEATH PUNCH) and is available via iTunes and Amazon. The band has toured with the likes of DROWNING POOL, OTEP, LACUNA COIL, BUTCHER BABIES, GEMINI SYNDROME and more.